Vice President Binay emphasized the positive contribution of overseas Filipino workers to the Philippine economy and that of their host countries, while highlighting the high social cost of labour migration for the Philippines. He emphasized how Filipino migrants become catalysts for inter-faith harmony in their host communities. He called on ASEM partner countries to work together to mitigate the adverse impact of migration by bringing down “all physical and legal barriers to allow migrant workers to bring their families with them, or at the very least to allow family visits on the most liberal terms”. H.E Päivi Räsänen, Finland’s Minister of Interior and Church Affairs, and EU Ambassador to the Philippines Guy Ledoux also gave key messages during the opening ceremonies. Minister Räsänen stated that “immigrants are a valuable part of our societies and a substantial resource that helps to promote our common welfare. However, contacts between different customs and beliefs can sometimes give rise to tension.” In view of this, equal dialogue founded on mutual respect for fundamental freedoms and human rights is critical for the promotion of peace and welfare of mankind. 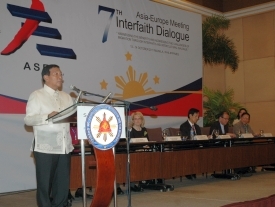 The Manila Statement on ASEM Interfaith Dialogue on Migration called on ASEM member countries to promote understanding, tolerance and respect for diversity of cultures, and for freedom of religion and beliefs in the context of increased mobility and people-to-people interaction. Honorable Esko Hamilo (Finland’s Undersecretary of State), Honorable Nicolae Adrian Lemeni (Romania’s State Secretary for Religious Affairs), Honorable Carlos Garcia de Andoin (Deputy Chief of Cabinet of the Minister of the Presidency of Spain), and Ambassador Zhang Xiaokang (of the Chinese Ministry of Foreign Affairs), Mr. Ovais Sarmad (Director of the Manila Administrative Centre of the International Organization for Migration), Ms. Carmelita S. Dimzon (Administrator of the Overseas Workers Welfare Administration), and Professor Datin Dr. Azizan Binti Baharuddin (Director of the Center for Civilizational Dialogue of the University of Malaya) also shared their views on the theme. Three parallel working groups discussed the Conference’s sub themes, namely, fostering social harmony and mutual understanding between migrant and host communities through interfaith and intercultural dialogue; promoting dialogue among migrant communities of different faiths, and utilizing new media in forging mutual trust and confidence in multi-ethic and multi-religious societies. 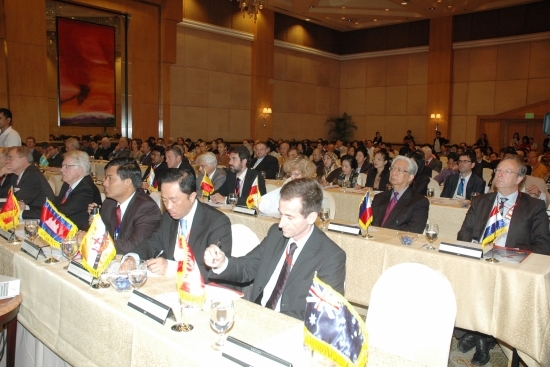 Acting Secretary of Foreign Affairs Rafael E. Seguis, Minister R?s?nen and Ambassador Ledoux co-chaired the ASEM IFD7. The Philippines acknowledges with appreciation the EU’s financial support that ensured a high turn-out of participants, which contributed to the success of the ASEM-IFD7. Religions for Peace Australia funded the attendance of one delegate to the Youth Roundtable, which occurred in tandem with this event. A report will be available soon.